Smart Garage Door Openers are Here to Stay! Smart home technology has become a standard rather than just an add-on these days. Home automation and security is becoming more important and necessary every day. Being able to control your home through your smartphone is a convenience that we’ve all become accustomed to doing, but why stop inside the house? Today, the latest garage door smart controllers enable you to open and close your garage door, turn on the security system and monitor your home remotely while you are away. There are numerous wifi-enabled garage door automation options to choose from, so we have helped put together a list of some of the best models that we frequently install in our clients’ homes. Whether you have an iPhone or Android, there is a smart garage door opener that syncs with your smartphone. The Liftmaster 8550W uses MyQ technology with built in wifi that alerts you about the status of your garage through your mobile device. Have you ever left your house in a rush and wondered if you remembered to close your garage door? We have all been there. With the Liftmaster 8550W, you can check instantly on your phone if the door was left open and can even set up a timer to close the door automatically after a set time. It also has built in security systems and motion detectors to turn on the lights when the garage is in use. The Genie with Aladdin Connect allows you to review the access history report for each opener as well as monitoring the door position at any given time. The opener is also UL 325 compliant which provides audible and visual signals before the garage door moves while operating from your smart device. 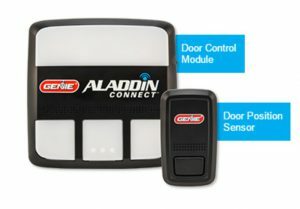 The Genie Aladdin Connect model is very simple to setup and install that you could have your new opener up and running in no time. 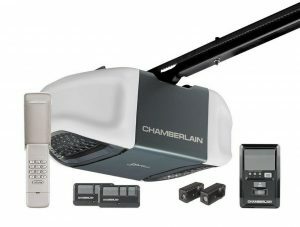 The Chamberlain Whisper Drive with MyQ technology is ultra-quiet due to the steel-reinforced belt. Additionally, with the 3-Button remote controls, it always finds clearest frequency for reliable performance over greater distances. The Chamberlain model is also extremely energy efficient using only 1 watt on standby power. The a wireless keypad creates unique 4 digit codes that enables simple and secure access without having to use a remote. Home automation has become easy and an increasingly affordable way to enhance your lifestyle and security. With all of the options out there, there is bound to be one that works best for you and your home. At Rockstar Garage Door Services, we have installed many of the wifi-enabled garage door openers and can help you make the right choice with the model that works for you. Give us a call today for your free estimate and we will be happy to help! Previous Previous post: What If Your Garage Door Remote is Stolen?